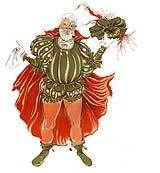 Of all the plays written by the fellow who used the pen name "William Shake-speare," the most adaptable to other media is A Midsummer-Night's Dream. It shines as a play, glistens as an opera, and sparkles as a ballet. In commissioning Christopher Wheeldon to create this story for them in 1997, the Colorado Ballet showed a great deal of faith in the then fledgling choreographer. They were well rewarded. Wheeldon's production is not only faithful to the play, but takes what can be a confusing plot—of lovers falling in and out of love with their partners and other partners' partners—and, with the selective use of mime and expressive movement, clarifies the action. Combining a broad sense of humor with inventive storytelling and marvelous flying effects that enhance Felix Mendelssohn's famous score—sumptuously delivered by Adam Flatt and the orchestra—Wheeldon's ballet effortlessly invokes the magical world of fairies, a genre that, in fact, began with this Shakespearean tale. From the moment that Puck sails in through the trees until the lovers are united to the tunes of Mendelssohn's stately wedding march, followed by Oberon and Titania sweet reconciliation, we are seamlessly transported back to mythical Athens and its surrounding, supernatural woods. On opening night, the elegant Maria Mosina and the stately Igor Vassin, as Oberon and Titania, draw us in with their regal atmospherics and otherworldly costumes, keep us enthralled with their alternately humorous and soulful encounters, and take our breath away with their final heartfelt pas de deux. The four lovers, Sayaka Karasugi, Caitlin Valentine, Shunsuke Amma, and Christopher Ellis are delightfully campy and they chase one another's tails in circles, wrestling with each other and their mercurial affections. Dana Benton's Peaseblossom and Emily Bromberg's and Shelby Dyer's Demi Fairies spin off scintillating baubles of virtuosity, in stark, yet telling, contrast to Gregory K. Gonzales's earthy, delightfully soft-headed Bottom. The cast is supplemented with the crowd-pleasing addition of two dozen children in the roles of faeries, cupids, and sprites. 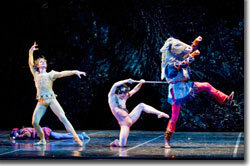 The Colorado Ballet's fanciful production of A Midsummer Night's Dream runs through March 14th. 303-837-8888 or www.coloradoballet.com.